Melinda Yalingu, Rural Development Officer in a group work and discussion with fellow course participants during a Financial Management session. Papua New Guinea’s public servants have boosted their leadership skills with the nationwide rollout of Pacific Institute of Leadership and Governance’s district training program. More than 300 public servants have been trained in key public sector skills in 2018 – including project management and financial management – better enabling them to deliver services to their communities. Public Service Minister Elias Kapavore said the revitalised Institute is committed to enhancing public sector performance throughout Papua New Guinea. “The Pacific Institute of Leadership and Governance is focused on training ethics and values-based leaders who can drive improved service delivery and economic development,” Mr Kapavore said. The district rollout is supported by the Pacific Leadership and Governance Precinct, a partnership between Papua New Guinea and Australia that supports the development of public sector leaders. “The Precinct is building the capacity of current and emerging public sector leaders – working at an academic level, through vocational training and by encouraging discussion about important topics,” Mr Kapavore said. The training rollout also brought public servants from different districts and provinces together to build networks, share experiences and collaborate on solutions to regional development challenges. 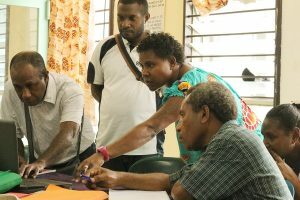 District and local-level public servants have now benefited from courses run in East New Britain, East Sepik, Morobe, Southern Highlands, West Sepik and Western Highlands. One of the course participants was Melinda Yalingu, a Rural Development Officer in Morobe Province, who said she is committed to using the training to build up local agriculture projects in Nawaeb. “Our role as public servants is to improve the sustainability and livelihoods of the people in the districts,” Ms Yalingu said. Brian Mogu, Special Projects Officer, Huon-Gulf District. Brian Mogu, Special Projects Officer with the Huon Gulf District, is in his 44th year of public service and said project management and financial management are important, practical courses. “It has given me confidence and broadened my ability to manage, operate and maintain the subjects that were taught,” he said. “I believe field officers in all divisions in agriculture, fisheries, clerks, and even for the Local Level Government and District administrators are now better prepared to carry out their duties in the field,” he said. 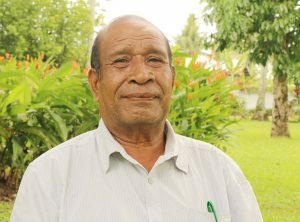 Brian graduated with a Diploma in Public Administration and Middle Management from the Pacific Institute of Leadership and Governance (then-Administrative College) in 1977 and said the recent courses have refreshed his skills. “With the reforms came new systems and these courses have broadened my knowledge,” he said.